Below is our diary about our "hands-on" project at Living Springs. 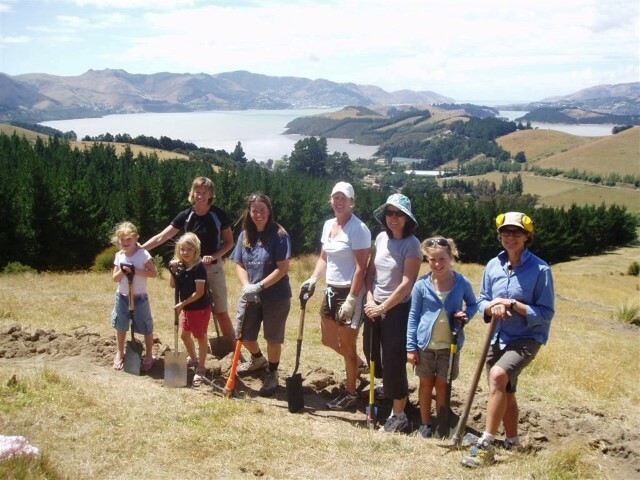 Follow links for information on Port Hills XC trailbuilding and Vulcaniser history. Trailbuilding is a great way to get to know others and is very satisfying, especially when you know that lots of people (including yourself!) are going to enjoy the fruit of your labour for many years to come. 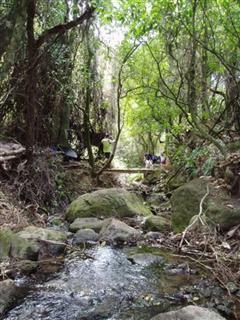 Living Springs in Allandale, Lyttelton Harbour has beautiful forest singletrack (Native Broadleaf and Kanuka, as well as Pine and Eucalypt), some technical and some easier, a few open spur trails and outstanding views straight down Lyttelton Harbour. There are also great facilities on site for when we hold events, and it's all just over the hill from Christchurch! With the constant birdsong, fantastic harbour views and beautiful forested gullies, Living Springs is a lovely place to ride, an awesome race venue and fun course to spectate at. In total we originally planned to ultimately create a 10-15 km circuit. However, the stage 2 project on the upper slopes was put on hold due to the 2010-11 earthquakes loosening a large number of rocks, then a heavy rain event set off an extremely large landslide, causing considerable damage. Even 8 years on there is still considerable rockfall hazard in places up there so we're not sure what to do long term. These tracks were built entirely with volunteer labour and in the past we've also benefitted from occasional Community Work crews. 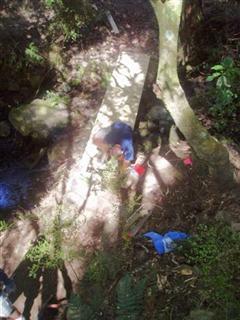 We used to have several trailbuilding days throughout the year but these days we just focus on maintenance. If you would like to be involved (even just a couple of hours occasionally), please let us know and we'll get in touch with you when we are heading over there and need a hand. We would like to acknowledge the many people (listed on the right) who have volunteered their time to help us create (and maintain) the Living Springs trails so far. Thanks to all of you! Pub Charity, who provided Huxster with a grant in 2007 for MTB cattle grid materials and gravel. This project could not happen without all this generous support so we are very grateful for receiving this. The donations from riders attending our 2007-08 BikeHQ hillclimb series have been used to purchase items such as Geogrid (to improve grip on the bridges), and paid for Zane to attend a trailbuilding workshop. Many thanks to all the riders who gave towards this. At an average of about 3-4 hours per visit, approximate total hours spent building and maintaining these trails to 16 May 2016 is: (3.5 x 969) 3392 Volunteer Crew hours, plus (4 x 160) 640 Community Work crew hours. 9 Novemer 2008 - Continued improving Zane's (6) - 100th trackbuilder! Note:Quite a few people are riding the tracks now. Zanes takes longer than The Pines and Mississippi to dry out after rain. 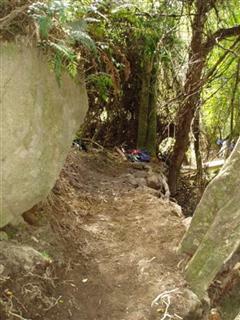 16 October 2010 - Got some on site advice from Nick Thurley on how the track should flow through Bellbird Gully's Four Corners section.